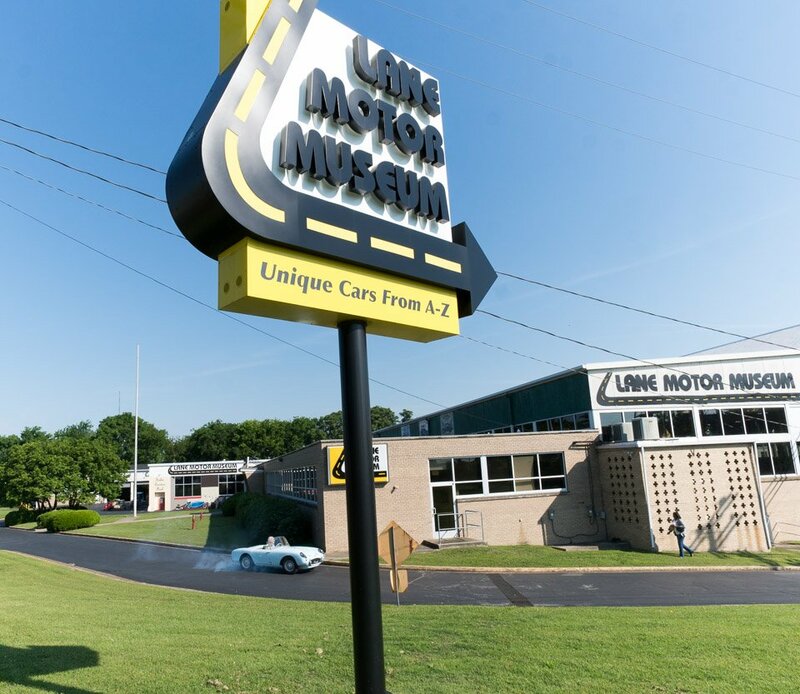 If you’ve never been to the Lane Motor Museum in Nashville, Tennessee, you’re missing out on one of America’s greatest automotive gems. 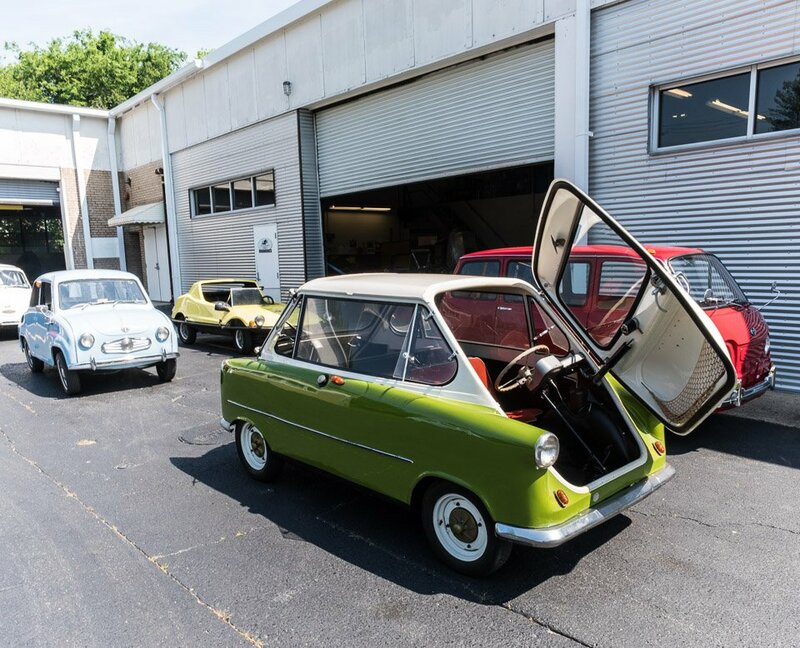 This amazing museum features hundreds of incredible, rare, and offbeat vehicles from around the globe, many of which are still in drivable condition. 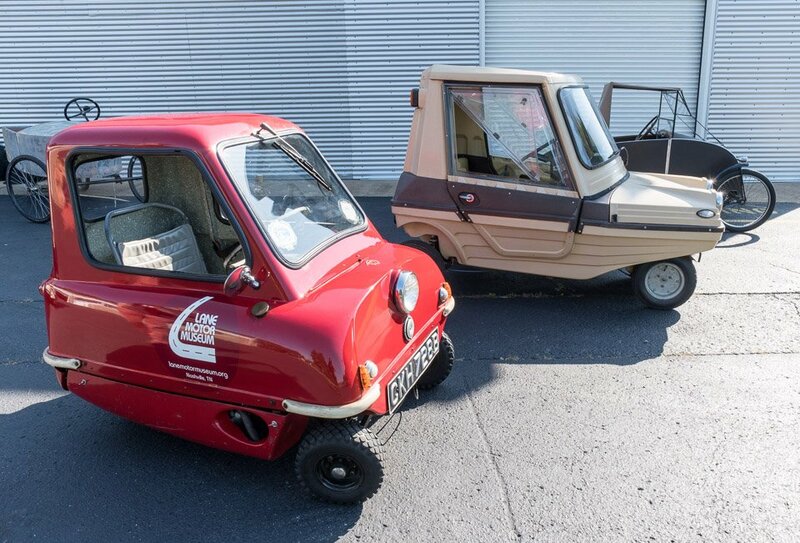 Starting later this month, a new exhibition will be opening, focused on some of the many unusual microcars which the Lane now has in its collection. 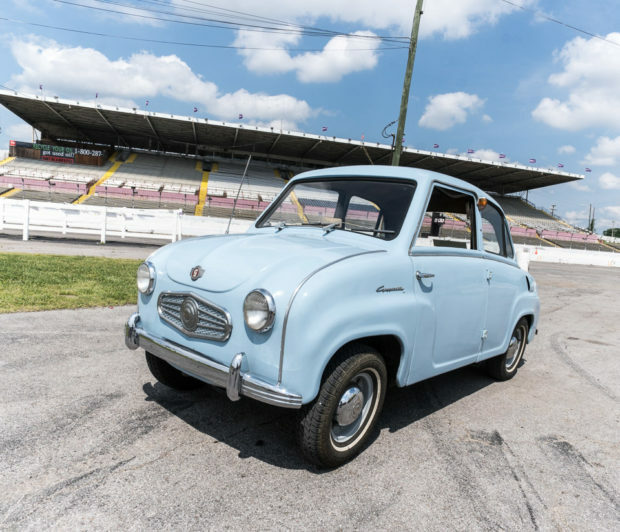 Microcars initially sprouted up in the years after World War II in the truest example of necessity being the mother of invention. With rising costs for fuel, steel, and other materials, both Europe and Japan set out to create small cars which were fuel-efficient, and used unconventional materials, like fiberglass. 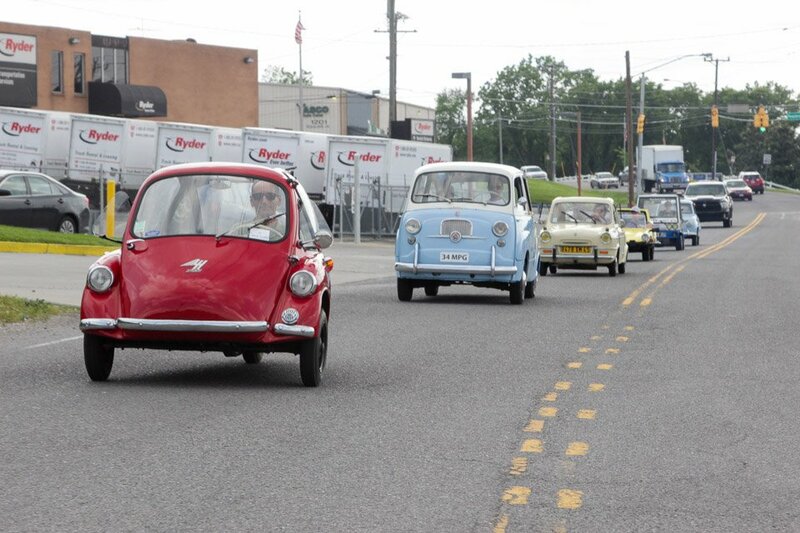 Most of these cars were built using scooter engines, and all but one of the cars in the Lane’s collection has a 400cc or smaller engine. To put that in perspective, the average push lawnmower has a 200cc engine. So yeah, these things aren’t fast. 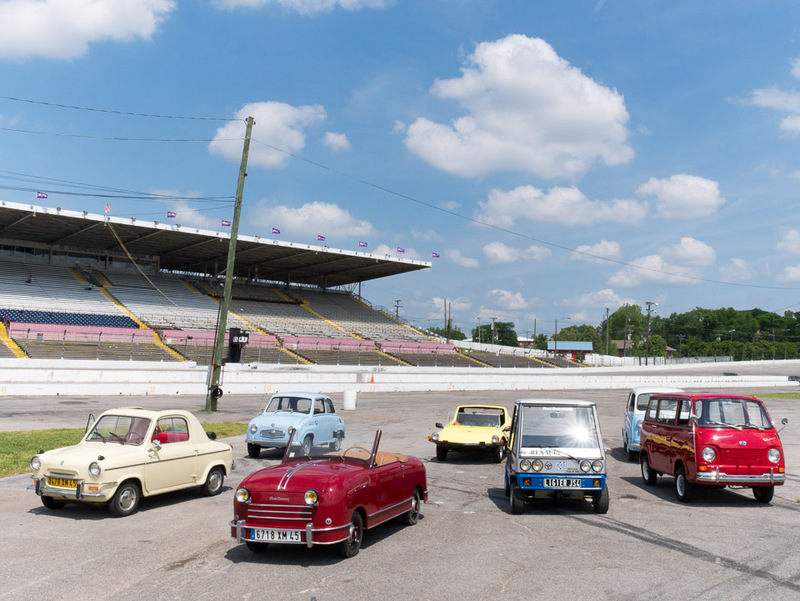 During my visit to the Lane, I not only got to see a number of the quirky little cars bound for the exhibition, I actually was allowed to drive some of them. 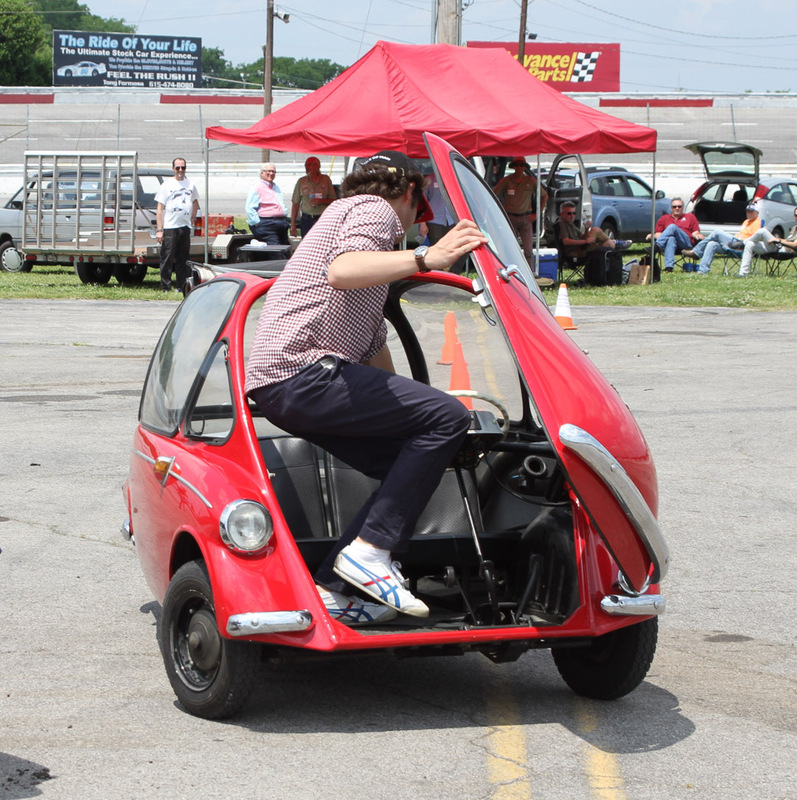 I measure in at 6 feet tall, and weigh a good 250, so getting into each car required a bit of contortion. I was surprised to find that headroom was pretty good in all of them, thanks to the minimal use of materials in the ceiling and seats. The trick was mostly finagling my legs around the stationary steering wheels and tight control pedals; but size be damned, I was going to drive me some tiny cars! 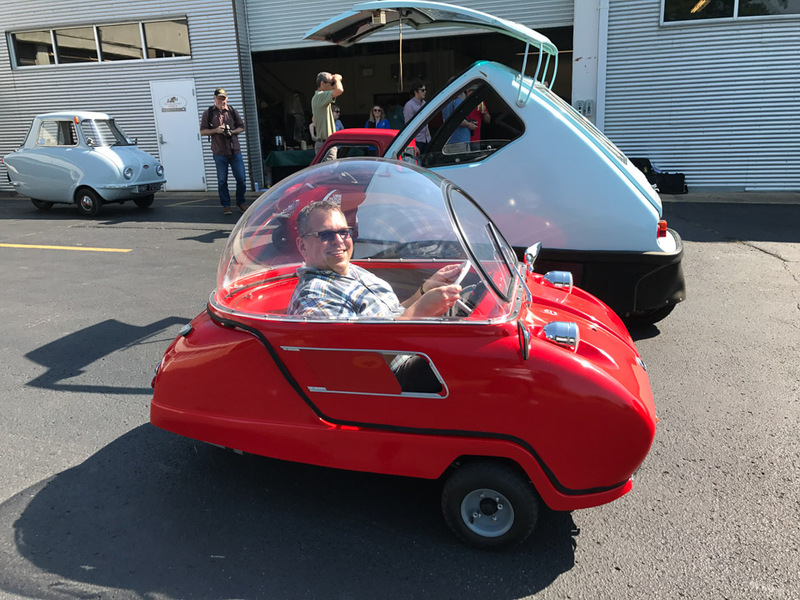 I started out in a controlled environment – in the parking lot behind the museum, driving such wonders as the bubble-shaped Peel Trident, a car which immediately turns its occupants into bugs undeneath a magnifying glass in the 85º southern sun. 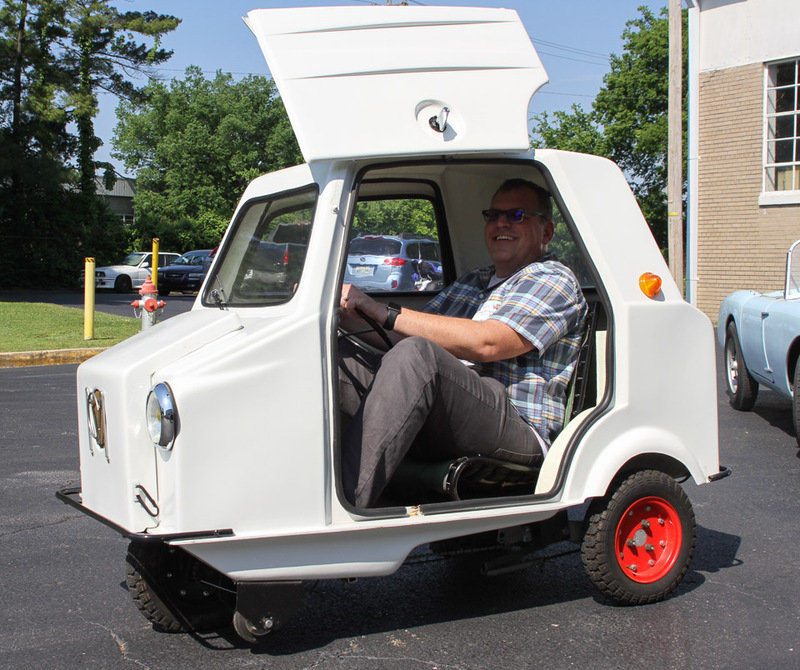 After a few jaunts around the lot in various vehicles, I was quickly thrown to the wolves, and asked to drive through Nashville traffic in a diminutive Goggomobil T300. 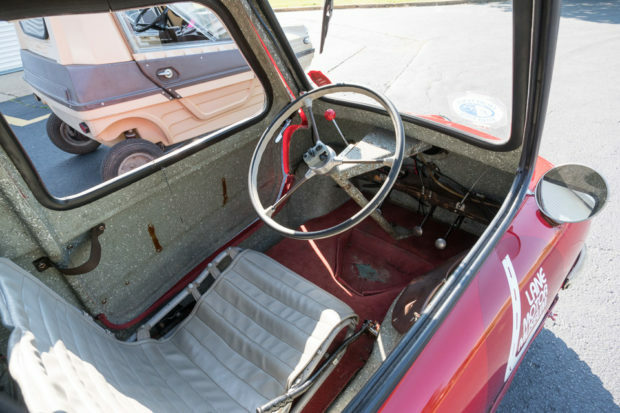 It was a bit of a nailbiter to drive the sky blue Bavarian bomber between 18-wheelers pickups, and SUVs, all while managing its twitchy clutch, and unusual gearshift pattern. Hills were especially fun to manage. Oh, did I mention it was right-hand drive too? Our destination? The Fairgrounds Speedway Nashville – a track which has served as home to numerous NASCAR races over the years, and is still active for some lower-level races. 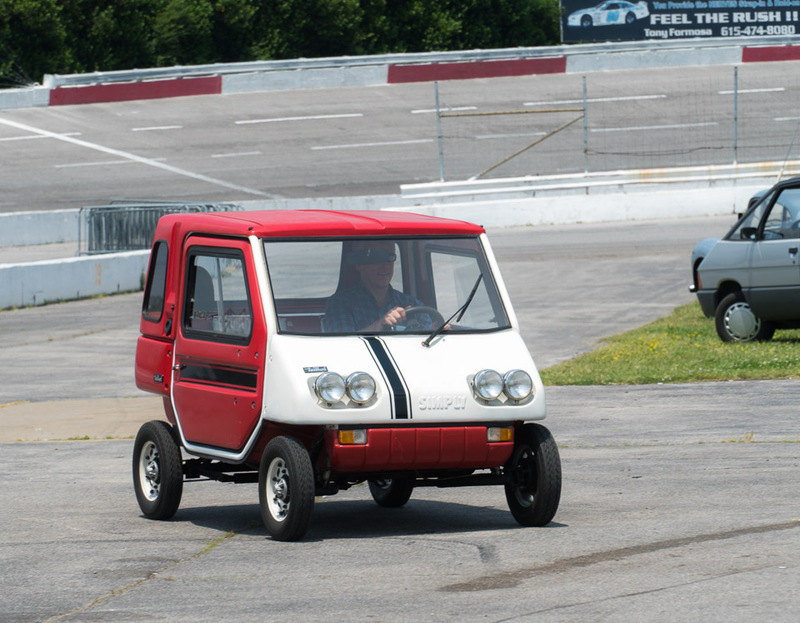 I can think of few sillier ideas than driving one of these diminutive microcars around the 18º banks in the corners, but that’s exactly what set out to do. Only these cars maxed out around 50 mph – about 1/4 the speed of a NASCAR stock car. With most of the vehicles having been built without any sort of uniform standards, each one required a bit of education – typically to figure out how to start and shift, and what some mysterious unmarked button. I got into one vehicle that was missing its key – and was told jam in any key I had on my keyring to start it up. It did. 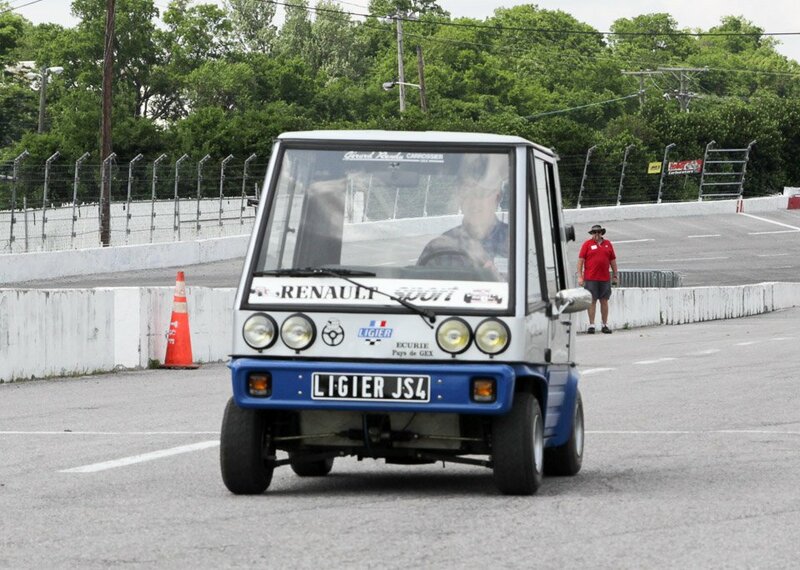 Out on the track, some of the little cars performed admirably. For instance, the little yellow 1980Subaru Fast Track II was a blast. With its open-top tub design, 40 mph felt more like 100 mph going into the turns. 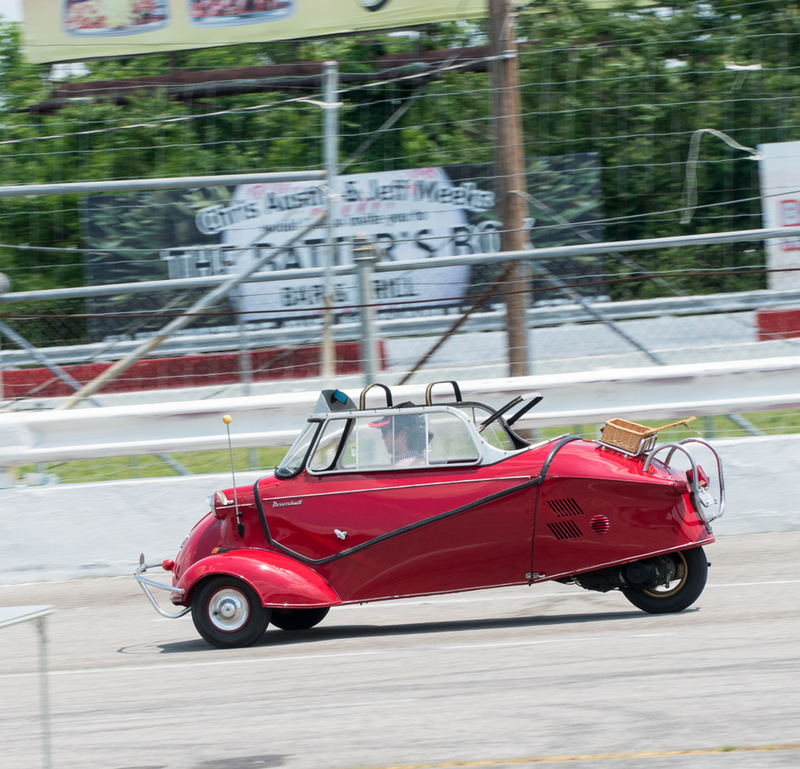 On the other hand, some of the vehicles were downright terrifying at speed – the airplane-like Messerschmitt KR-200 had a really cool cockpit, but the steering just wandered wherever it felt like. My little Goggomobil T300 was surprisingly put together on the oval – even though it took some serious skill to avoid accidentally touching the brake while accelerating thanks to its tiny pedals – and my big feet. 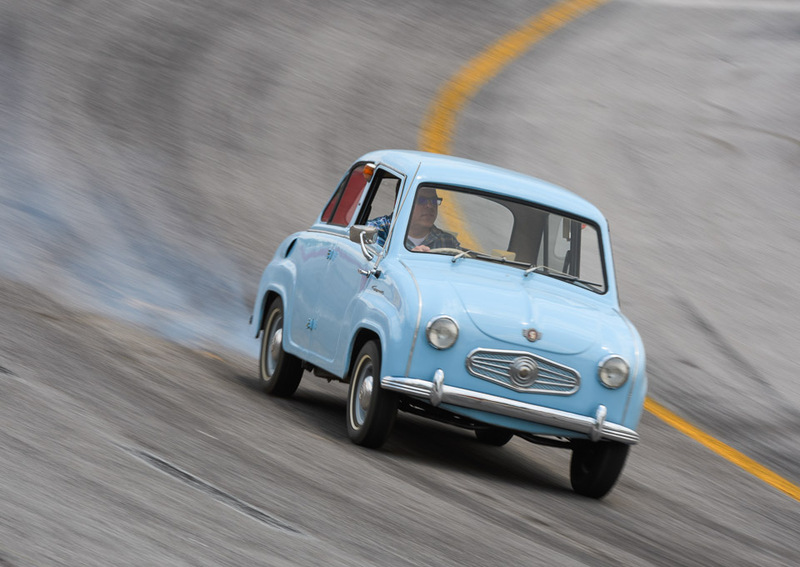 Along the way, we got to compete in the world’s slowest gymkhana – a race which involved not just a slalom and tight turns, but repeated stops and exits from the cabin of the 1958 Heinkel Kabine – a tiny front-opening car that’s reminiscent of a BMW Isetta. The grand finale for the day involved a drag race to see who could get the best time, first in the 1981 Teilhol Simply – an adorable, but arguably the slowest vehicle on hand. In fact, it’s so slow that museum President Jeff Lane managed to beat it to the finish line on foot. Then we got our shot at the 1980 Ligier JS4, an awesome little ride which I’d actually love to have in my garage. It may look a little like the Simply, but this one is good. Sure I still only hit about 22 mph over the 200 foot dragstrip, but it’s a blast to drive. It’s got a surprisingly ferocious little exhaust note, golf cart quality handling, and a surprisingly easy to use sequential shift setup. 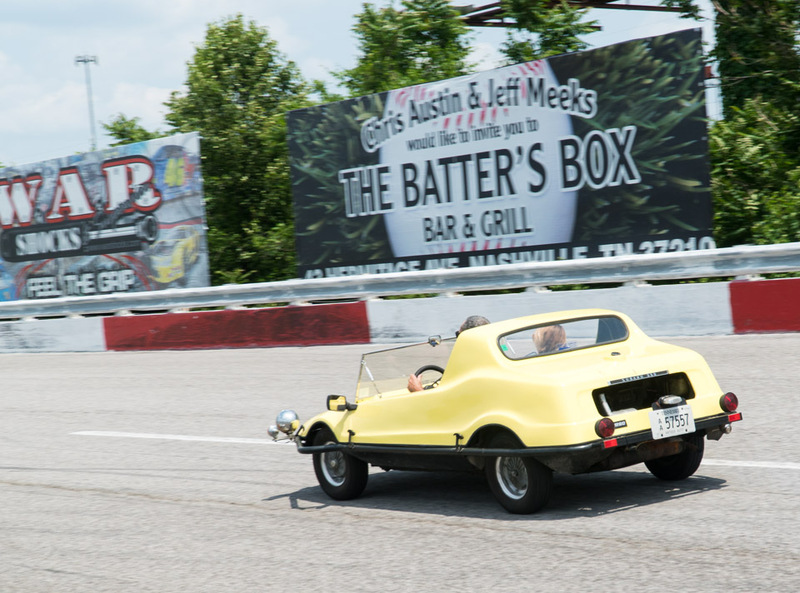 While visitors to the Lane Motor Museum won’t get the same chance to head out on track with these goofy little cars like I was so blessed to have experienced, they will get to see these and many more nifty cars on exhibit starting on May 25. Whether you’re a serious gearhead, or just love visiting interesting and unusual attractions while on vacation, I highly recommend a visit to the Lane.